What do you value more in an ultrabook: mobility, power or price tag? If your answer tilts further towards the first two aspects rather thanthe latter, then Lenovo‘s new ThinkPad X1 Carbonmight be for you. The ultrabook is set to drop(figuratively) on Aug. 24 and since it’sonly 3 lbs. despite its generous 14-inch screen, it’d probably make muchless noise than one would expect if it hit the ground (literally). The 14-inch screen on Lenovo’sThinkPad X1 Carbon can fold to lie completely flat. Computerworld‘sBrian Nadel took this baby for a spin and mostlyliked what he found, including the aforementioned lightweight body (itweighs 2 oz. less than Fujitsu’s own 14-incher, the Lifebook), somezippy performance power courtesy of the Intel Core i5 3427U processor,and asuper fast charging system (Lenovo’s Rapid Charge technology had thebattery 50 per cent charged in just 22 minutes and fully juiced up inabout an hour). The drawbacks? Nadel points out that like all ultrabooks, this onedoesn’t come with a DVD drive, and you also won’t find any VGA or HDMIports on this machine either. The biggest point to ponder might be theprice. 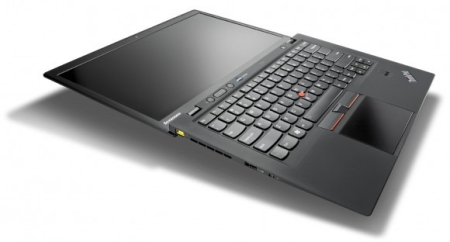 At $1,349 the ThinkPad X1 Carbon is a little on the steep sideeven among the ultrabook set. All things considered, tested and weighed (both literally andfiguratively), this is a high-quality ultrabook, Nadel writes. Ifyou’re willing topay for it.